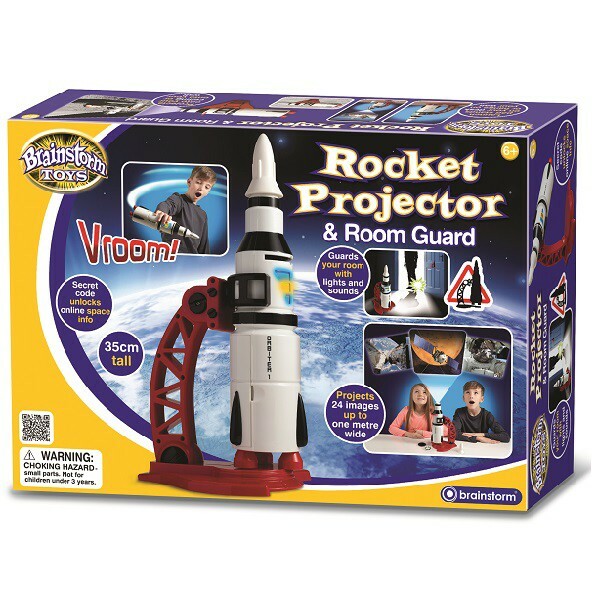 Rocket Projector & Room Guard - spacekids - space toys, dressing up costumes, kids spacesuits, astronaut food, cool space stuff! The 35cm tall model rocket will bring the excitement of space travel into your bedroom. It has 24 space-themed colour images of planets, astronauts and spacecraft to project onto your walls and ceiling. Complete with a table-top or wall mounted launch pad. 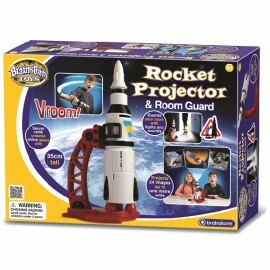 Flick the switch and the Rocket blasts into room guard mode with fun flight sounds and lights. With a built in motion sensor to detect movement, when an unwanted visitor ventures into your room you will know about it! Turn on your rocket – 3, 2, 1 launch! Projector features 24 amazing images of planets, astronauts and spacecraft on three changeable discs. Projected images are up to one metre wide. Flick the switch and your rocket blasts into room guard mode. A motion sensor triggers lights and launch sounds with each unwanted visitor. Fun flight sounds when rocket is in play mode. Cool launch pad stands on your desk or hangs on your wall. Secret code unlocks fascinating online space info. Includes bonus Launch Zone door sticker.